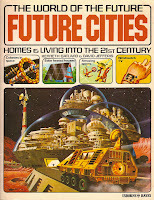 As promised, here is page 12 of the amazing 1979 book Future Cities: Homes and Living into the 21st Century. 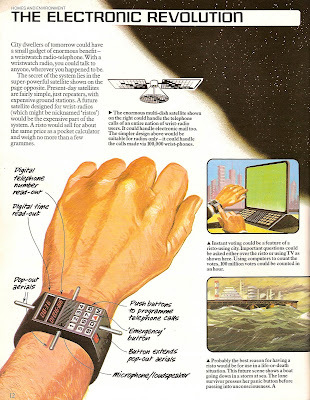 My favorite aspect of this page is that not only are they speculating the coming of the radio-telephone wristwatch, they're speculating its nickname. The "risto" may not be a common sight today but I really wish my cell phone had "pop-out aerials." Also, check out the "instant voting" they anticipate one could do through their "risto." I certainly forsee no problems with that. Electronic voting machines are pretty widely accepted as reliable in 2007, right? Stay tuned, this book is over 30 pages of paleo-future goodness. They weren't too far out: the Breitling Emergency chronographs have some of the features of this concept - but not the phone functions! I recommend 'The Shape Of Further Things' by Brian Aldiss, in which he posits something very similar to the Risto, although ten years earlier. There actually was a late sixties/early seventies transistor radio watch called the 'Wristo'. It was enormous due to the double AA battery required.